Each spring, salmon and steelhead juvenile fish, called "smolts," are carried by melting snow roaring down swollen creeks and rivers to the Snake River in Lewiston, Idaho. Here, the fish enter a 350-mile hydroelectric complex. The smolts are either directly killed by dams and reservoirs or stressed sufficiently to reduce their ability to survive ocean life and return as adults. This loss is called "latent mortality," meaning the fish are less fit to survive estuary and early ocean life after they have run the 8-dam gauntlet. During the migratory journey, salmon smolts are beginning to transition from freshwater to saltwater, called "smoltification." Smolting requires changes in olfactory receptiveness, vision and metabolism. Saltwater contains less oxygen than freshwater; hence, smolts need more hemoglobin. They take on a silvery appearance for ocean life. The physiological change during smolting is very stressful. Timing is everything. Arriving too early at the estuary - before they have sufficiently smolted via salmon barges or arriving too late via the dams and reservoirs - can be disastrous for salmon survival. 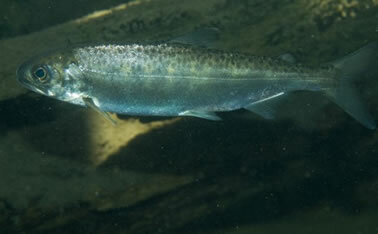 In the pre-dam era, swift river currents would carry the smolts tail-first to the estuary in a week. 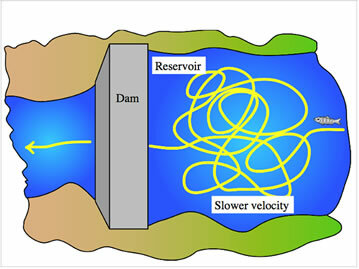 Nowadays, it averages three weeks depending on flow because of the slower moving reservoirs. As an alternative to speed up the migration, the Army Corps of Engineers collects large numbers of smolts at the Snake River dams and barges them through the 8-dam hydroelectric complex via the navigation locks. The trip takes 2 days. Nearly 100% of the fish survive the barging journey but many of the juveniles perish from delayed death because of the stress caused by reservoirs, the un-natural migration method (removing the fish from the "river") and the atrocious way in which the juvenile fish are collected - diverting them into high-pressure piping underwater below the crest of the dams. Steve Hawley, author of Recovering a Lost River: Removing Dams, Rewilding Salmon, Revitalizing Communities, said this about the Corps' claims on fish survival in the barges. "This is like claiming a cure for cancer by pointing out all of the terminally ill patients who survived the van ride from the chemo ward to hospice."